Sepsis is the major cause of mortality both at Virginia Mason and nationally. In improvement events at Virginia Mason focused on acute and unstable patients, early identification and treatment of patients with sepsis was identified as a potentially rich area for additional improvement work. Virginia Mason then began a series of events focused specifically on the issue of sepsis, ultimately leading to a protocol termed the “Power Hour.” The Power Hour has cut recognition time in the hospital from eight hours to 30 minutes, and decreased the time to antibiotic administration from 140 minutes to 66 minutes on inpatient units. After successful implementation in the hospital, the Power Hour was expanded to the Outpatient Infusion Center (OIC) where it decreased time to treatment from about nine hours to less than 60 minutes. In years past, the process for admitting or transferring patients to Virginia Mason from clinics, hospitals and regional providers involved multiple calls, potentially from multiple different locations within the organization. Virginia Mason began a series of improvement events, starting with a 3P and including multiple RPIWs and kaizen events, aimed at creating a single point of entry for patients, regardless of their origin point. All of those incremental improvement events culminated in the creation of our hospital admissions center, resulting in decreased wait times and fewer handoffs for patients. A patient with a new hip or knee has restrictions and limitations which make getting into a car a significant challenge. The Physical Medicine and Rehabilitation Department at Virginia Mason owned a mocked up car for patients to practice on, but it was outdated and had functional limitations. It couldn’t be adjusted for the variety of heights of today’s vehicles, and it was very heavy and could not be moved to accommodate patient needs. An initial kaizen event was held with the goal of creating something new to meet this need. Using the concepts of Moonshine, the team created a prototype which has been tested and refined through multiple Moonshine work sessions. Virginia Mason partnered with MJM International Corporation to manufacture the new therapy car. It is now available for other hospitals and rehabilitation facilities to purchase through Patterson Medical. The transition of a patient from hospital to home can be very complicated for both patients and care providers. If there is not clear education for patients and clear responsibilities for care providers things can get missed, potentially leading to patient re-admission. Virginia Mason kicked off work on optimizing care transitions for patients discharging from the hospital with a 3P (Production, Preparation, Process) event and, over several years, built incrementally on that 3P with a series of RPIWs and kaizen events. After a recent RPIW, the decision was made to centralize this delicate process for the benefit of our patients and care providers and a transitions center was opened in 2017. Virginia Mason used VMPS to develop a Patient Safety Alert (PSA) system that requires all staff who encounter a situation likely to harm a patient to immediately report it and cease any activity that could cause further harm. If the safety of a patient is indeed at risk, an investigation is immediately launched to correct the problem. From the program's inception in 2002 through today, more than 75,000 PSAs have been filed. 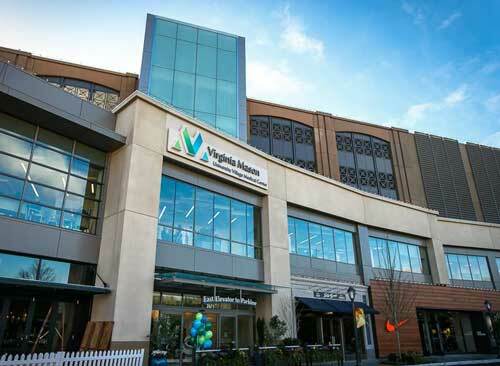 Patient safety at Virginia Mason has increased and professional liability claims have dropped. Using VMPS, the Floyd & Delores Jones Cancer Institute at Virginia Mason was redesigned with a laboratory and pharmacy inside, eliminating the need for patients to travel throughout the hospital for chemotherapy. Now all cancer services are brought directly to the patient in his or her private treatment room. For one patient, this reduced the length of a chemotherapy visit from 10 hours to two, and saved about 500 feet of walking at each visit. Moving is never fun. But while relocating and expanding our Sandpoint Pediatrics Clinic, Virginia Mason took the opportunity to redesign the structure and patient flow. During a 3P workshop, team members’ input enabled the creation of a new clinic environment that encourages better flow. Moving patients into specially designed rooms allows staff to better signal patient needs, while improved functionality allows providers to pass on paperwork and materials without leaving the patient’s side. Emergency departments (ED) are a major entry point for hospitals and can be a bottleneck. ED patient care is typically more expensive and involves longer wait times. Using VMPS, the ED team at Virginia Mason learned to predict appropriate staffing levels for times of greatest demand. A "team sort" process was implemented that uses standard clinical assessment tools to quickly identify and sort patients' care needs. Those requiring minimal services receive express treatment and are discharged without going to patient-care beds. This creates capacity for patients who require more extensive services. This work helped Virginia Mason decrease the number of hours the ED was closed and unable to receive new patients by more than 90 percent over the past two years. In 2011, after multiple improvement events including a 3P to design the new space, Virginia Mason moved its ED into a more efficient space. Since then, the ED has continued to improve, most recently with a series of events to improve treatment and monitoring of patients with behavioral health needs.